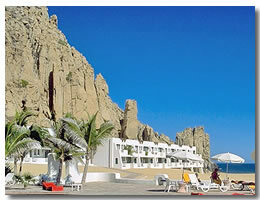 On a trip over to El Arco one day we drove into the Solmar Suites hotel in Cabo San Lucas to get some feedback from some of the guests staying there. We stayed in Cabo for quite a while so a hotel like this was a little out of our budget even though it's no where near the cost of your usual Cabo Resort. And the best part about is you're right on the Pacific Ocean so you can wake up to stunning views if you're on the right side of this Cabo hotel. Walking around the Solmar Suites hotel is breathtaking with the ocean views you have. The pool's nice, and so are the grounds. This isn't the Hacienda but it's about a third of the price, and this does show on a few of the amenities. We got talking to a few people about the hotel, and we was getting quite a mixed reaction. Some people absolutely loved the hotel while others hated it. One couple were very unhappy with their room as it was over the laundry room. This gave them non-stop noise for their whole Cabo San Lucas vacation. The hotel's service was a big complaint with a lot of travelers. But again, the service was perfect for other guests. It seems that whoever you book your Stay at the Solmar Suites with could have an effect on how you're treated, and on which room you stay in. Booking up with one of the larger companies might carry some weight when you're bartering over rooms with the staff. The larger travel agents will at least be in your corner when you need them. 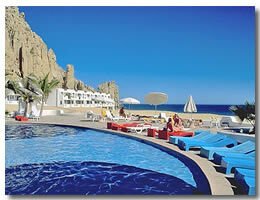 Staying at the Solmar gives you the privilege of using the facilities at the Playa Grande. This Cabo hotel is owned by the same people that own the Solmar Suites so they provide free mini bus that travels between the two hotels. 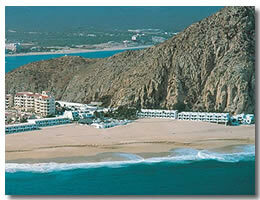 The Solmar is about a 15 minute walk from downtown Cabo. This is good if you enjoy your nightlife and your food. There are loads of restaurants downtown that you can eat at. The beach at the Solmar Suites is on the Pacific Ocean so you can't swim there. This makes the beach very quiet and peaceful. If you want to visit a busy beach where you can swim you can get a water taxi over to the El Medano Beach. That's the most popular beach in Cabo San Lucas where you can enjoy good food at the restaurants, and have a go at some of the activities.